It’s hard to say that it is winter here in Los Angeles. After a few chilly and rainy days, followed by hot sunny days, we are only reminded when we see how cold it is in the rest of the country. 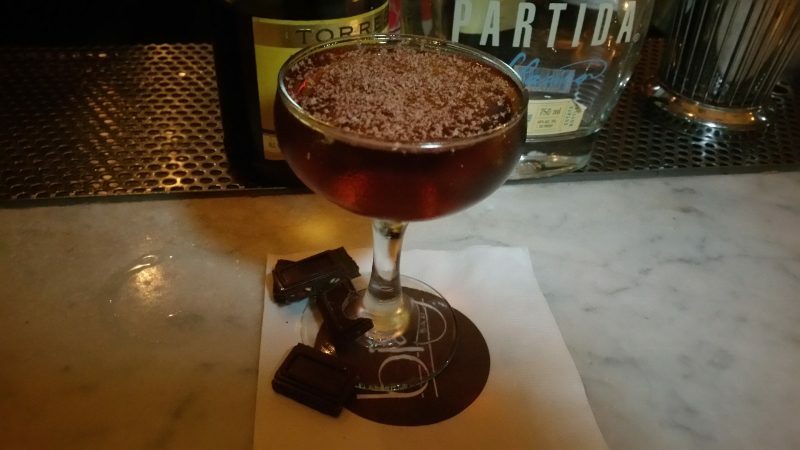 But, no matter the temperature, it is winter and with the season comes a new cocktail menu at Big Bar in Los Feliz. Big Bar is a friendly, neighborhood bar and this is reflected in the bar team. A passionate group of bartenders who work together and share ideas, it is through their collaboration that this new seasonal menu has been created. And, the story behind each drink gives reason to the name and choice of ingredients. 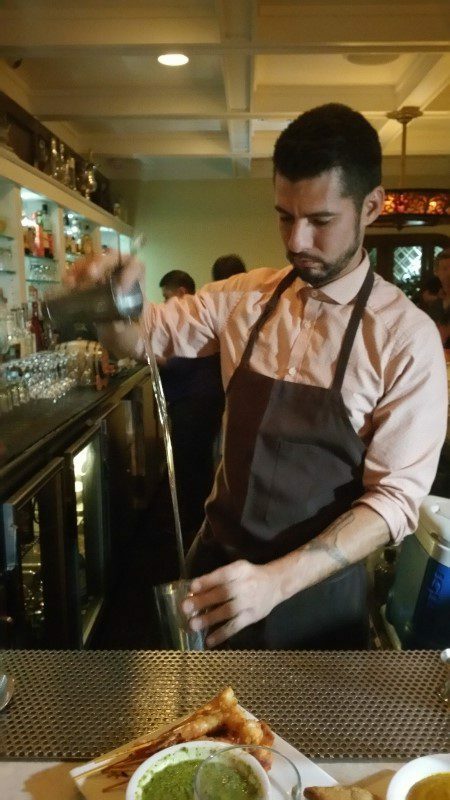 Aaron Alvarez has been at Big Bar for 8 months and this is the first cocktail list that he has been very involved in creating. So, it was all the more appropriate that we started with the very first drink Aaron ever made at Big Bar. The Redrum (Bacardi 8, Smith and Cross Jamaican rum, cherry, bitters, lime) has a classic daiquiri base and was made to pay homage to The Shining, which was shown at Big Bar’s movie night. 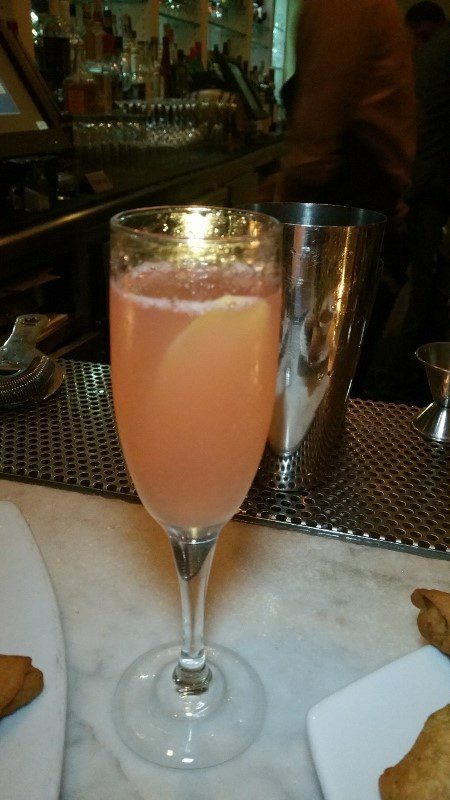 Miss Grey is made with Singani 63, Aquavit, Peychauds, lemon and Cremant bubbles. 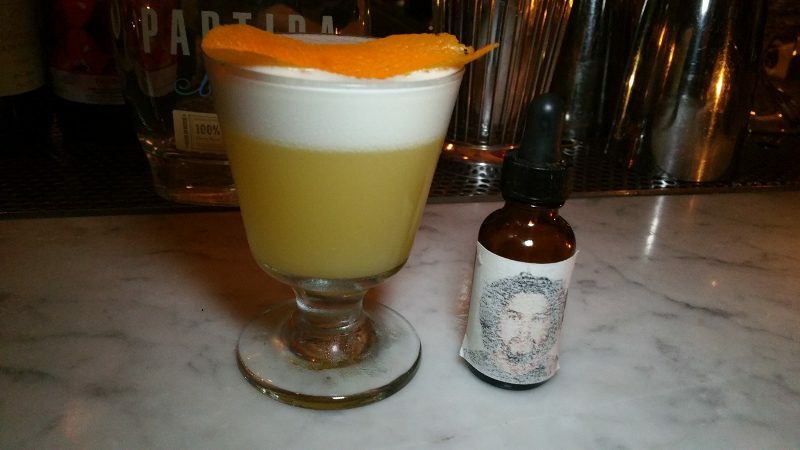 As Singani 63 is Steven Soderbergh’s new Bolivian pisco, the cocktail was created to honor his film The Girlfriend Experience. It is floral, light and pretty with a backbone, like the character Sasha Grey. The Cremant bubbles are a perfect compliment to the drink as they are not as yeasty as Champagne and not as light as Prosecco. 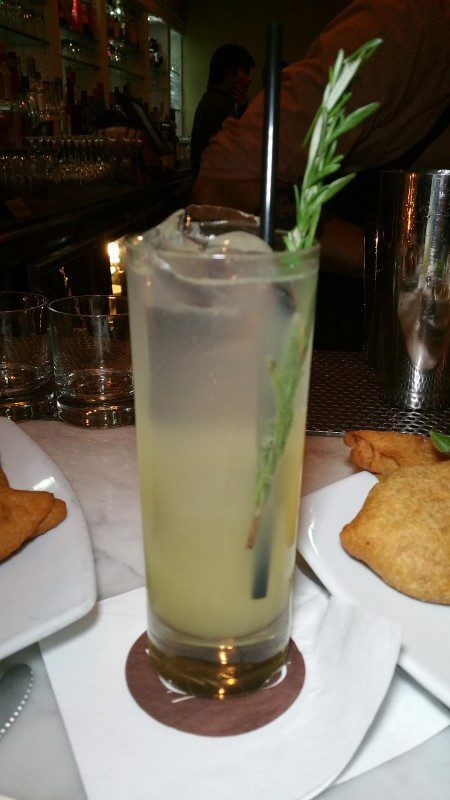 The super smoky Burning Bush, made with Montego Boss Mezcal, Chatreuse, rosemary and pineapple cordial, was aptly named. 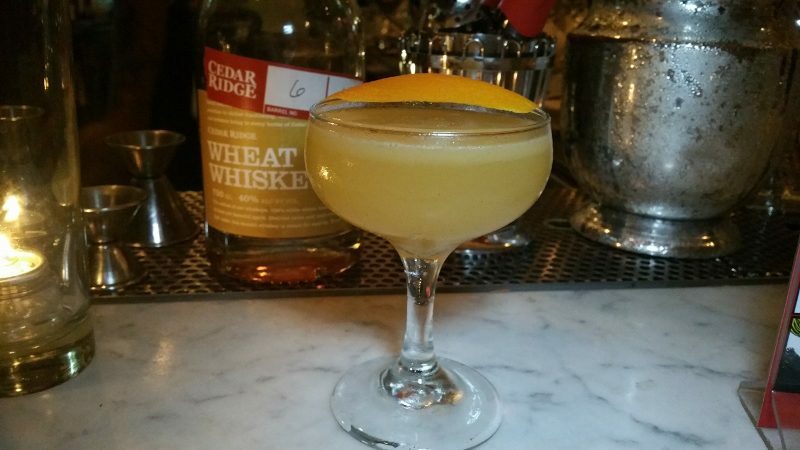 Aaron created the Lazy Dazy, made with wheat whiskey, apple brandy, Cointreau, persimmon and lemon, to offer the perfect cocktail for a winter day in LA. The richness and the warmth of the apple brandy is brightened with the tartness of the persimmon syrup. This is my kind of drink. 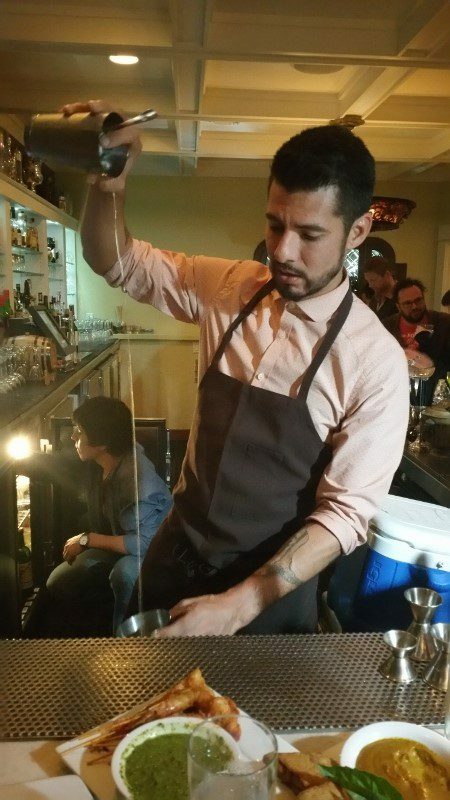 It was beautiful to watch Aaron throw the pomegranate syrup and vermouth. Throwing is gentler than shaking and stronger than stirring and the resulting drink tasted like a smooth, silky ribbon or silk sheets with a slightly sweet note. 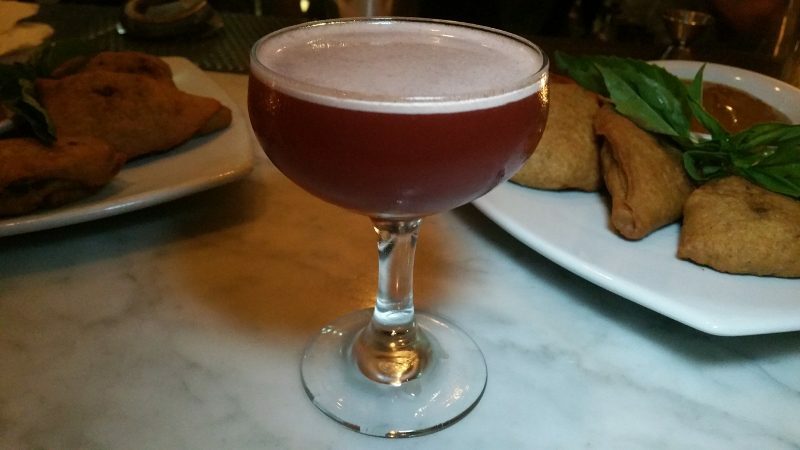 Sari Not Sorry is a gin-tiki drink that looks pretty and is sweet on front, bitter on finish but has a richness mid-palate. 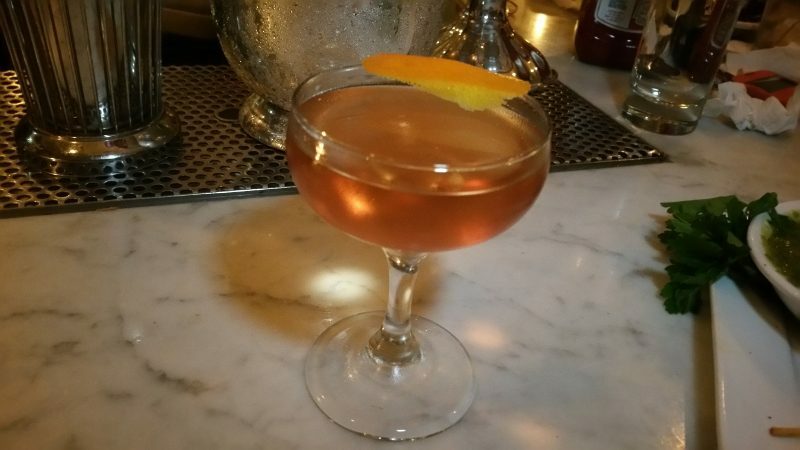 The name of the drink is because it is made with Bombay Sapphire East, which has a lemongrass character, as well as maraschino, lemon, raspberry and Cynar. For Aaron’s final drink of the night, he served the A Revoir Poire, made with Grey Goose Pear, Montenegro, Bonal (a French aperitif) and pear brandy. 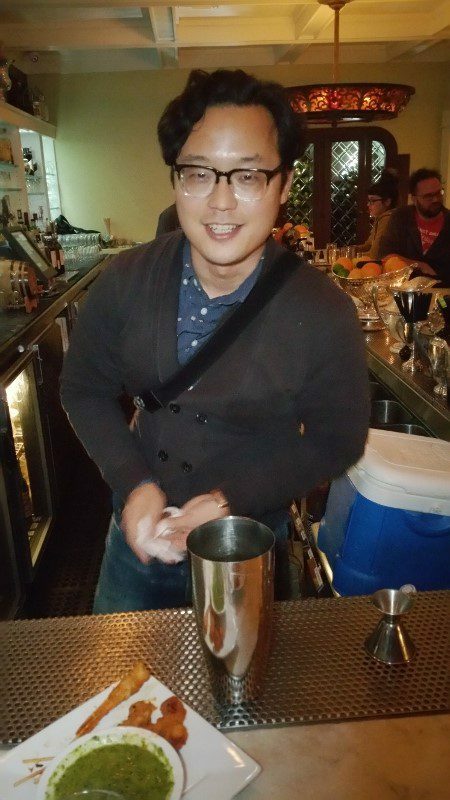 Next, Eugene Lee stepped away from behind the camera to step behind the bar. His first drink is the Tequila Lifeboat, made with Partida Tequila, habanero, orange juice and “Juan’s disappointment”. 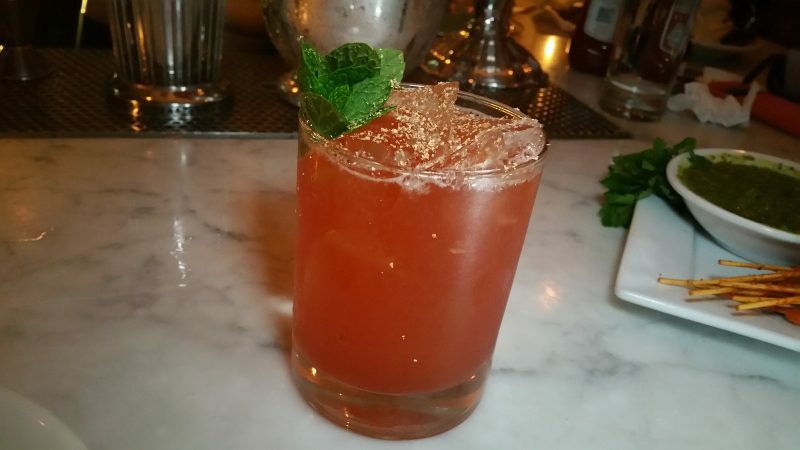 Eugene originally made this drink for Kirsten Dunst while he was supposed to be learning the basics of cocktails. Kirsten liked the drink so much, she ordered it every time she was at Big Bar, much to the disappointment of former Bar Manager Juan. 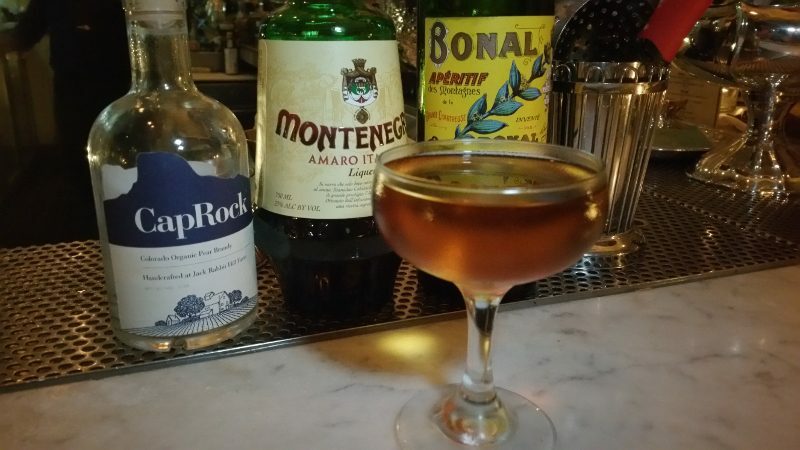 Eugene also made Portugal, The Cocktail with Spanish brandy, Armagnac and Ginja, a sour cherry liqueur from Portugal which Eugene found when he was on his honeymoon in Portugal. 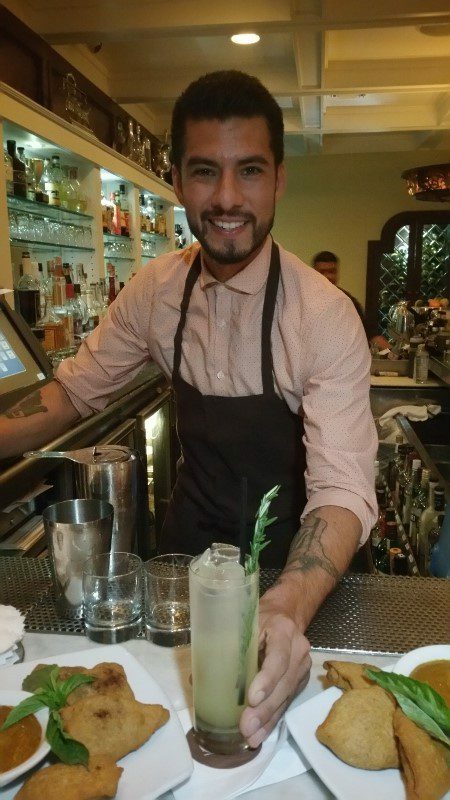 The final drink of the night was prepared by talented barback and up-and-comer Mario Tecuapacho. 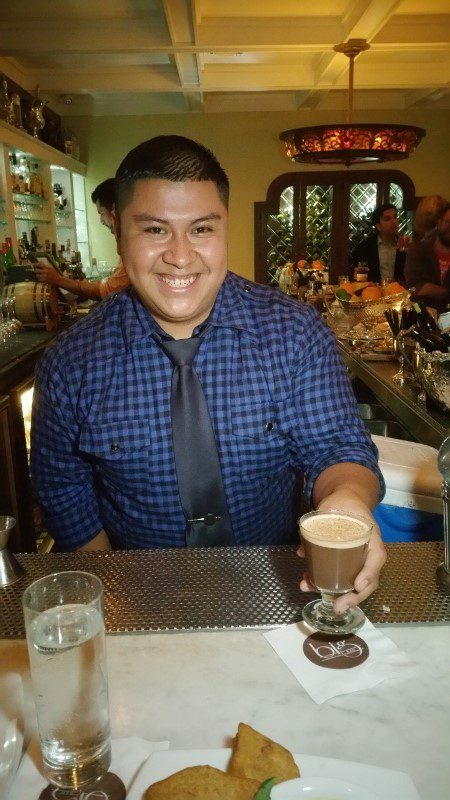 Mario, who loves Toddies and hot chocolate, wanted to create something like hot chocolate but not a hot drink. 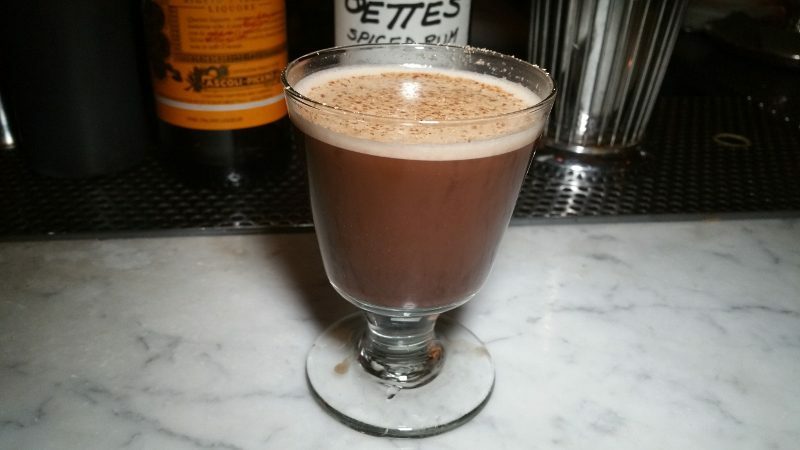 He came up with the delicious Hot Chotoletti made with Stolen Rum Coffee and Cigarettes, Meletti (an Italian liqueur with flavors of anise and saffron), chocolate and almond milk. 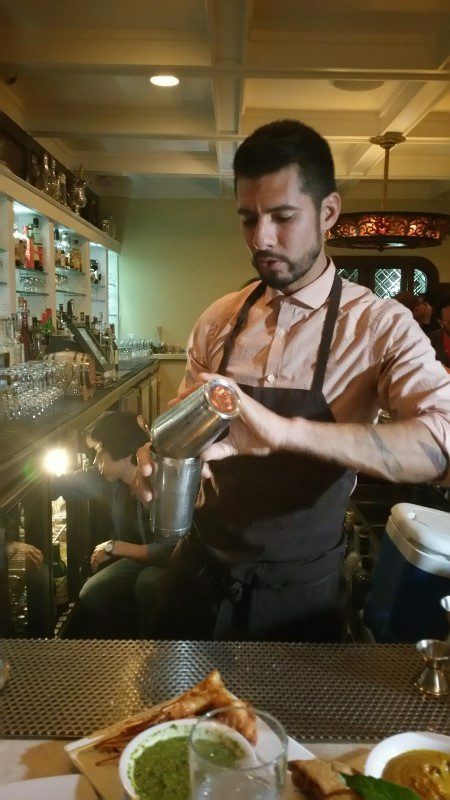 If Mario makes more drinks like this one, he will be behind the bar in no time. This entry was posted in Cocktails and tagged Aaron Alvarez, bar, Big Bar, Big Bar Alcove, Big Bar Los Feliz, cocktail, DrinkWire, Eugene Lee, Ginja, Liquor.com, Los Angeles, Los Feliz, Mario Tecuapacho, singani 63, winter cocktail menu, winter cocktails by Allison Levine.